Enriching bright minds to dream, inspire, and achieve. Why Choose Bright Minds Academy? Exceptional programs of study, dedicated employees, and flexible hours are just a few of the features that make Bright Minds Academy distinctive. We are committed to helping each child develop skills utilized in higher order thinking. We show them how to approach learning imaginatively with a positive attitude. We cater to children ages 6 weeks up to 12 years old. We foster and encourage every child’s emotional, intellectual, social, and physical development. We promote discipline, self-cultivation, and exploration in all our children. We understand that each child is different and as a result, we are dedicated to catering to the needs of each in order to help identify and nurture the child’s innate talents and gifts. 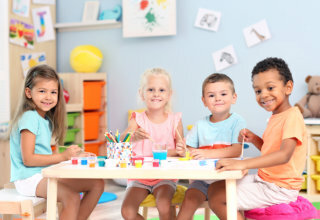 We are an all-inclusive program which follows the enhanced standards and guidelines established by the Georgia Department of Early Care and Learning (DECAL). Our center meets and surpasses the Georgia Early Learning and Development Standards (GELDS). We also place a high priority on keeping our center family oriented. In doing so, we establish bonds with our children and parents that remain intact even when they leave our program. By creating these bonds, we grant each child the tools they need to be successful. At Bright Minds Academy, we served breakfast, lunch, snack and supper daily. We encourage healthy eating habits and hope that parents will collaboratively work with us for a healthier tomorrow with their little precious ones. We believe that a child’s early years are critical to his/her development and future success. As a result, we are dedicated to arming each child with the necessary tools and skills that will prepare them to be tomorrow’s leaders. A solid foundation is imperative for a future growth. We provide an environment where a child is encouraged to think imaginatively and Dream. Our instructors aim to Inspire our children with guidance and rich experiences, and each child is made confident to believe that they have the power to Achieve their goals and aspirations when they leave. If you want to know how our institution can develop your child’s academic excellence, you can contact us or set an appointment.